The Diamond Federation of Hong Kong, China (DFHK) is a non-profit organisation aiming to protect the integrity of the diamond trade and the interests of consumers by standardizing business practices. While pursuing a mission to maintain Hong Kong’s reputation as Asia’s diamond center, as a world shopping paradise and as Asia’s world city, the DFHK works closely with the Hong Kong Tourism Board, the Consumer Council, the Hong Kong Trade Development Council, and various government authorities. 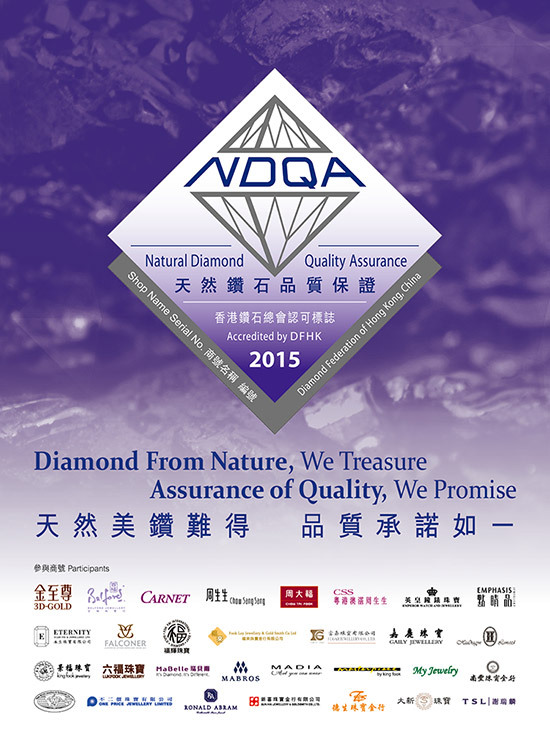 A Natural Diamond Quality Assurance Mark (NDQA Mark) launching in 2015 aims to uphold Hong Kong’s status as a diamond trading hub at both the trade and consumer levels. The DFHK undertakes a leadership role to protect consumer rights with cooperation from the diamond industry. Following the success of the Quality Gold Mark and the Natural Fei Cui Quality Mark, the DFHK initiated the NDQA Mark as an ultimate quality assurance to strengthen consumer confidence and desires to buy diamonds in Hong Kong. All participants in the DFHK’s NDQA Mark scheme agree to be bound by the DFHK’s Integrity Pledge and all relevant laws and regulations, including the Trade Description Ordinance and its orders. For any diamond above 0.30 carat, merchants must clearly and correctly state its carat weight, colour and clarity not only verbally, but also on an invoice. Scheme participants are committed not to sell artificial, made-made and synthetic diamonds or any other non-natural diamonds of similar nature. The DFHK acts as an independent third party to monitor the quality of diamonds, checking if they are natural, if they have been treated and if claims about them are accurate. This process entails initial assessments of any merchant’s background or reputation and impromptu on-site inspections, after which diamond samples are assessed by independent and reputable authentication laboratories. In addition, the DFHK sets a self-regulatory manual and advises on precautionary measures to ensure that the diamonds which merchants sell are natural. Such measures cover diamond sourcing procedures, traceability of goods, natural diamond screening equipment and other devices and monitoring systems. The DFHK strives to educate consumers that when buying diamond jewellery in Hong Kong, their rights are fully protected by Trade Description Ordinance and its orders. According to the ordinance, “diamond’ means “natural diamond”. Any description of non-natural diamonds using the single word “diamond” without an expression of artificial, made-made, synthetic or similar may be regarded as deceptive disclosure and lead to criminal prosecution. Furthermore, the DFHK stresses the importance of true representation of diamond quality. It educates consumers that all internationally recognized authentication on diamond quality (colour and clarity) is done by non-quantitative methods, and therefore one grade variance is acceptable. At all times, the DFHK promotes the rarity and distinctive characteristics of natural diamonds. These gems take billions of years to form deep under the earth’s crust. The rarity and preciousness of natural diamonds uniquely creates their intrinsic value, stirring consumers’ passions, affections and desires.